Socks, previously a simple garment used to keep feet warm, now a fashion accessory single-handedly generating millions of pounds annually. Once coming only in black, grey and rarely in red, this essential accessory is appearing in thousands of different patterns and variations. Swedish designers Happy Socks are specialists in the field, quickly turning illustrations and classic designs into wearable realities which are now stocked in top department stores across the world. They have become the one-stop shop for socks. A sock is just as an important accessory as a bag or watch is, and can they equally say a lot about you. A poorly chosen sock can ruin an outfit, but choose the right one; it has the power to transform it. But how do you wear socks interestingly? We have compiled the best ways to wear socks, showing you just how easy it is to pull off one of this season's most coveted looks. THE ROLL UP: Now, this one is simple and very effective. 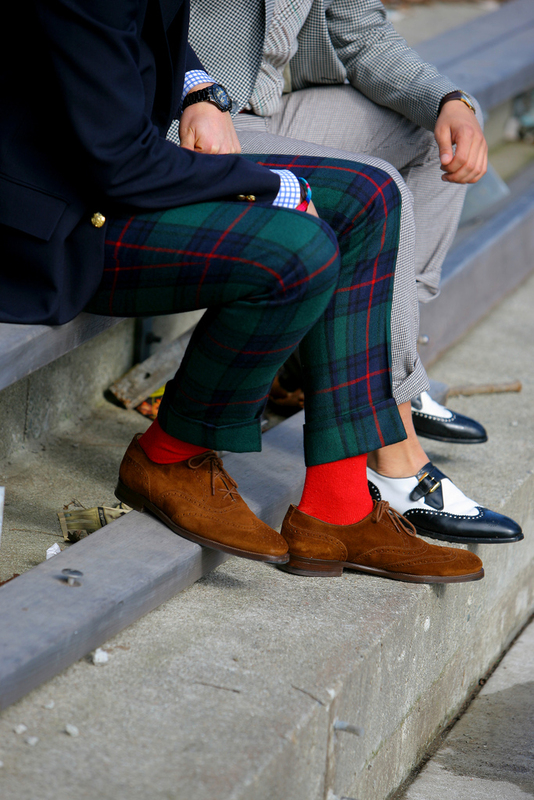 Roll up your jeans or smart trousers, and show off a statement sock. Team it up with brogues or classic trainers. This look can be worn by men young and old and is perfect when you want to lighten the mood with a playful edge. THE SKY'S THE LIMIT: Wear them high. With your shorts (which are becoming shorter and shorter), choose a patterned sock or plain colour to accessories with your low-top trainers. Just remember one thing although short shorts are slowly becoming acceptable, by no means does it allow you to pair socks with sandals. That is still a major fashion faux pas.